"Give me back my bicycle! I didn't do anything!" Guei has departed from the simpler farm life and arrived in the massive contemporary city of Beijing. His knowledge of this faster-paced life is extremely limited, and he bungles his way into awkward situations. One odd instance occurs during his work as an express bicycle courier. While delivering the package, Guei enters an upper-class office and takes a shower because of a misunderstanding about his identity. He simply follows the lead of others without realizing the proper way to function. Unfortunately, his company-owned, high-tech bike is stolen during this delivery. Possessing few options and talents needed in the big city, Guei vows to recover his stolen bike and regain his former position. Beijing Bicycle concerns the story of two teenage boys and their relationship with the renowned bicycle. Guei uses the courier job as a means to live in the city, and he does not have a second choice. Without the bike, the chances for his survival diminish considerably. On the other hand, Jian needs the vehicle to woo Xiao (Yuanyuan Gao)�an attractive classmate who fancies him. Unlike the car-driven society in America, China utilizes bicycles on a much greater level. Having one will allow Jian to ride to school and other places with Xiao. Unfortunately, his father continues to delay buying him this necessity, and the young man's frustration increases. Jian eventually finds a second-hand vendor and purchases a bike, which ends up being Guei's original stolen vehicle. This tale provides a saddening depiction of modern city life in China. Although still offering charming sights, Beijing's crowded streets also provide the troubling atmosphere for much pain and suffering. Guei's lone friend is a small-time shop owner who spends much of his days just sitting on the sidewalk. They both are enamored by a beautiful rich neighbor, who constantly changes into different extravagant outfits. However, her story also is less positive than our initial expectations. Jian possesses the qualities of a typical adolescent�anger at his parents, extreme timidity with girls, and a group of bullying friends. He wants to spend time with Xiao, but tries to balance a cool demeanor with his pals. When they come into conflict with innocent Guei, their confrontations are surprisingly disturbing and brutal. Both characters do have brief moments of bliss within this troubling environment. Guei's first days as an express courier showcase his inexperience, but they also reveal a lively energy that quickly dissipates. Following his purchase of the bike, Jian spends a joyous day riding with Xiao and feeling on top of the world. Their relationship seems ready to blossom, and his adolescent anger falls into the background. Sadly, when Guei discovers his bicycle and takes it back, the rising progression of conflict leads to a startling conclusion. Director Wang Xioshauai impressively frames the action with a subtle detachment that makes the audience strain to discover the events occurring. The violence is especially disturbing, but much of it remains offscreen to heighten its effect. Supported by a whimsical score, the story eventually seems to lead to a happier conclusion. By avoiding the easy route and providing a nastier ending, Xioshauai and the writers increase the story's overall power. They use the smaller bicycle story to present a wider, more distressing look at present-day China. Image Transfer Review: Beijing Bicycle utilizes a worthwhile 1.85:1 anamorphic widescreen transfer that contains a very small number of flaws. The lively colors of Beijing spring from the screen in the happier moments, while the dirtier streets also have the proper visual tone. This transfer includes a surprisingly clear picture that seems a bit unusual for a small-scale, bare-bones release. Seville deserves significant credit for this attractive picture. Audio Transfer Review: This release includes a decent 2.0-channel Dolby Surround track that presents the material in a clear and understandable manner. The score gives the picture a whimsical atmosphere, and this transfer presents it effectively. However, the audio remains centralized and never moves above an acceptable level. The sound field is not very complex, and the sounds remain stationary with the middle. The overall effect is enjoyable, but it lacks the extra touches to warrant a higher recommendation. Extras Review: Beijing Bicycle's lone extra features on this Seville release are theatrical previews for three acclaimed foreign films�Three Seasons, the first American film shot in Vietnam; Fire; a romantic comedy that takes place in India; and Kandahar, a drama in Afghanistan. The first two previews contain widescreen transfers, and the last one appears in the full-frame format . Compared to the Columbia Tri-Star release's 28 chapter cues, the 12 stops on this earlier version have a lesser attraction. 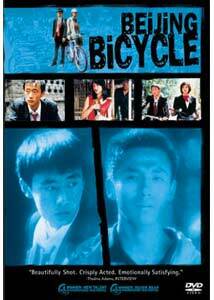 Beijing Bicycle initially appears to offer a silly, enjoyable tale of adolescents squabbling in modern Beijing. Much of the early moments are engaging without being too threatening to the boys' survival. However, events gradually move in a darker direction and reveal the violent feelings hidden within everyone's minds. The result is a gripping tale that will remain with you for a considerable time after the closing credits.